This is the first book to study the middlebrow novel in France. Middlebrow is a derogatory word that connotes blandness, mediocrity and a failed aspiration to ‘high’ culture. However, when appropriated as a positive term to denote that wide swathe of literature between the challenging experimentalism of the high and the formulaic tendency of the popular, it enables a rethinking of the literary canon from the point of view of what most readers actually read, a criterion curiously absent from dominant definitions of literary value. Since women have long formed a majority of the reading public, this perspective immediately feminises what has always been a very male canon. 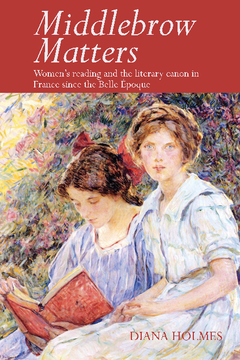 Opening with a theorisation of the concept of middlebrow that mounts a defence of some literary qualities disdained by modernism, the book then focuses on a series of case studies of periods (the Belle Époque, inter-war, early twenty-first century), authors (including Colette, Irène Nemirovsky, Françoise Sagan, Anna Gavalda) and the middlebrow nature of literary prizes. It concludes with a double reading of a single text, from the perspective of an academic critic, and from that of a middlebrow reader. Diana Holmes is Professor of French at the University of Leeds.